It is now widely recognized that countries around the world are becoming increasingly interconnected, and that both public and private organizations are of necessity becoming increasingly global. As political, legal, and economic barriers recede in this environment, cultural barriers emerge as a principal challenge to organizational survival and success. It is not yet clear whether these global realities will cause cultures to converge, harmonize, and seek common ground or to retrench, resist, and accentuate their differences. In either case, it is of paramount importance for both managers and organizational scholars to understand the cultural crosscurrents underlying these changes. With contributions from an international team of scholars, this book reviews, analyzes, and integrates available theory and research to give the best information possible concerning the role of culture and cultural differences in organizational dynamics. Figures; Tables; Preface; Part I. Cultural Foundations: 1. The culture theory jungle: divergence and convergence in models of national culture Luciara Nardon and Richard M. Steers; 2. Culture, organizations, and institutions: an integrative review Kwok Leung and Soon Ang; 3. When does culture matter? Cristina B. Gibson, Martha L. Maznevski and Bradley L. Kirkman; Part II. Culture and Organization Theory: 4. Culture and organization design: strategy, structure, and decision-making Richard M. Steers, Luciara Nardon and Carlos Sanchez-Runde; 5. Cross-cultural perspectives on international mergers and acquisitions GÜnter K. Stahl and Mansour Javidan; 6. Global culture and organizational processes Miriam Erez and Gili S. Drori; 7. Cultural variations in the creation, diffusion and transfer of organizational knowledge Rabi S. Bhagat, Annette S. McDevitt and Ian McDevitt; 8. Cultural variations and the morphology of innovation John R. Kimberly and Colleen Beecken Rye; Part III. Culture and Organizational behavior: 9. Understanding leadership across cultures Marcus W. Dickson, Deanne N. Den Hartog and Nathalie Castaño; 10. Global leadership: progress and challenges Joyce S. Osland, Sully Taylor and Mark E. Mendenhall; 11. The role of cultural elements in virtual teams Taryn L. Stanko and Cristina B. Gibson; 12. Cultural drivers of work behavior: personal values, motivation, and job attitudes Carlos Sanchez-Runde, Sang Myung Lee and Richard M. Steers; 13. Interdisciplinary perspectives on culture, conflict, and negotiation Lynn Imai and Michele J. Gelfand; 14. The complexity of trust: cultural environments, trust, and trust development Nancy R. Buchan; 15. Cultural variations in work stress and coping in an era of globalization Rabi S. Bhagat, Pamela K. Steverson and Ben C. H. Kuo; 16. Cultural values and women's work and career experiences Ronald J. Burke; 17. Intercultural training for the global workplace: review, synthesis, and theoretical explorations Dharm P. S. Bhawuk; Part IV. Future Directions in Theory and Research: 18. Improving methodological robustness in cross-cultural organizational research Fons J. R. Van De Vijver and Ronald Fischer; 19. 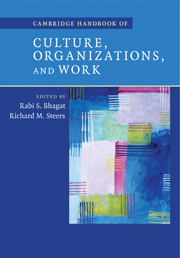 Culture, work, and organizations: a future research agenda Rabi S. Bhagat.